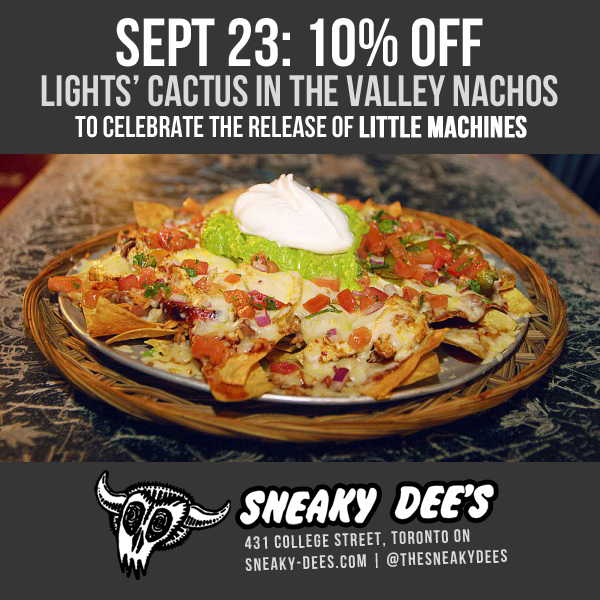 Lights’ Cactus in the Valley Nachos 10% off on Little Machines Launch September 23! Listen up! Lights, the sweetest artist around, is launching her new pop album Little Machines this Tuesday, September 23! We’re big fans of Lights, but she’s also a big fan of us and our nachos, so obviously we did what we do best and immortalized her awesomeness in her very own signature dish. We’re celebrating Little Machines by giving you 10% off Lights’ Cactus In The Valley dish this coming Tuesday. One day only! Her Cactus In The Valley nachos are tortillas-topped with seasoned chicken, rice, salsa roja, frijoles, grilled peppers and onions, then baked with cheese and topped with fresh guacamole and sour cream. Seriously, if you don’t eat these, we’ll come to your table and do it ourselves. Treat yourself to a plate of Cactus In The Valley nachos on Lights’ album release day, and you’ll get 10% off your plate, which you can then put towards your purchase of Little Machines. Nachos and great music – can you get any better? Hint: the answer is no.